At first look, the No Colour Bar exhibition seems like a straightforward showcase of works by artists within BLK Art group or with similar concerns. Beginning in the 1980s and coinciding with international political developments in racial independence and equality, the work of black British artist’s were finally recognised within the artist community. Artists of this movement shared a collective exploration of their British African-Caribbean identity through a politicised frame. Artists such as Eddie Chambers, Denzil Forrester, Sonia Boyce and Keith Piper critiqued institutionalised racism, class and gender relations in the UK. The exhibition draws its name from the ‘colour bar’ that formally and unofficially racially segregated communities across the world. Whilst No Colour Bar features artists directly related to this group, it is so much more than a prescriptive presentation of this movement. Challenging the assumption that artists originating from migrant communities suddenly came into being in the 1980s, the exhibition explores the environments, both physical and cultural, that lead to the flourishing of art, music, poetry and literature in this period. No Colour Bar reimagines this period of cultural heritage through the Bogle-L’Ouverture bookshop installation. Opened in 1969 by Jessica and Eric Huntley, the exhibition recreates the feeling of the bookshop - a meeting place and cultural hub for African Caribbean, and other migrant communities, artists, writers and activists. Hosting workshops, readings and lectures it was central not only to campaigns to equality but also academia. This physical embodiment of the publishing house will allow for a multi-sensory experience of a real life environment, incorporating sound and visuals as well as art and artefacts. It was here that a political, artistic and cultural mobilisation was established and later influenced the numerous artists of the Black British Art movement. 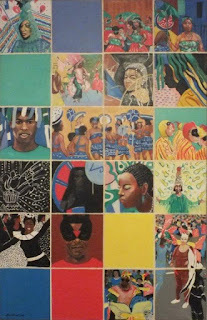 The exhibition is based on the lifeworks of Eric and Jessica Huntley, who founded Bogle-L’Ouverture Publications in 1969, and the community efforts they championed. As one of the first black-owned independent publishers in the UK, it gave a voice for writers with African Caribbean, and other diasporas, descent a space to explore their experiences which were under-represented and side-lined in the collective culture. Prevalent themes concerned presenting an accurate Black history, racism, colonisation and discrimination. Through the Huntley Archives, the exhibition explores the cultural milieu and shared concerns that permeated through not only art, but literature too. No Colour Bar stirringly explores the art of British migrant communities whilst comprehensively considering the political and historical foundations that these artists drew upon. Rather than presenting the work of Black artists as divorced from their cultural terrain, the exhibition seeks to recreate this through art, original documents, letters, images and press cuttings. Crucially, the numerous endeavours of these artists and activists is not shown as separate from the rest of London’s history, but a key element within its multiculturalist construct. The exhibition faithfully refutes its namesake, ‘no colour bar’ by championing the celebration of identity, race and culture that shaped Britain on the 1960- 1990s. By presenting the radical efforts of activist Britons to break down cultural barriers, it continues this struggle and, in the exhibition, erases the barrier between art and viewer through a multi-sensory, multi-faceted approach. No Colour Bar: Black British Art in Action 1960 - 1990 is a FREE exhibition, opening on the 10th July 2015 at the Guildhall Art Gallery and running until 24th January 2016.